Here's, what you have with the latest Gigabyte motherboard, users now can simplify custom liquid cooling into any computer build. 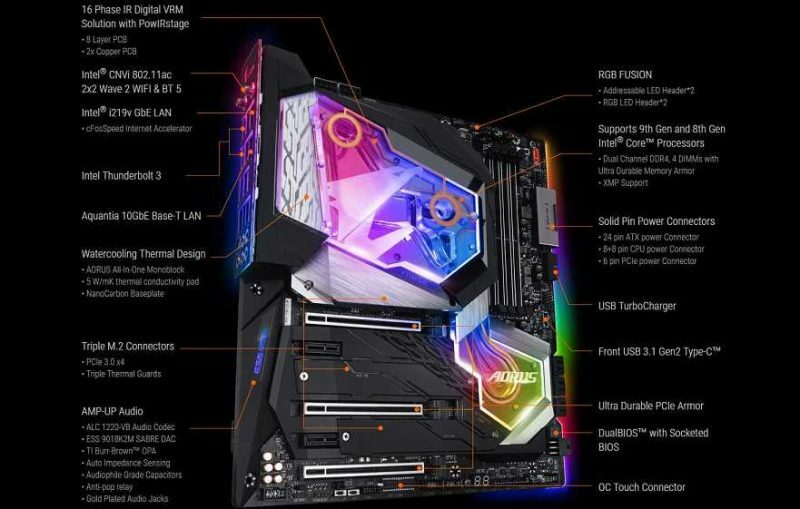 The new Z390 Aorus Xtreme Waterforce comes outfitted with an all-on-one monoblock that users can attach to the motherboard. A setup like this holds many advantages, one being it blends well with motherboards design aesthetic. Users still have to the sleeves up and get out the tools as the monoblock have to be installed, it doesn't come attached to the motherboard by default. The manual that's provided with kit instruct users to connect the LED_CPU and LED-PCH headers on the motherboard, then place the monoblock on the motherboard and then fasten the CPU backplate. But first make sure you insert the processor. The monoblock main job is to provide added cooling to the CPU and PCH area. Standout features are the RGB lighting, which you'll find in most high-end decked out gaming systems. For extra lighting the motherboard allows users to add RGB-LED strips. Though the monoblock is most certainly the deal-breaking feature, there are other features on this motherboard that should not be ignored. Starting with a 16-phase IR digital VRM, providing more stable and reliable voltage for handling potential overclocking. The motherboard also have full Intel Optane Memory support, onboard 802.11ac WiFi connectivity, two wired LAND ports ( one port being an Aqantia 10GbE LAN), Thunderbolt 3 connectivity, built-in power and one-touch overclocking buttons, three M.2 connectors, a robust rear I/O with significant number of USB ports, onboard audio that's embedded right around the ESS Saber reference DAC, and dual BIOS. At this time Gigabyte has not provided any details as to when the Z390 Aorus Xtreme Monoblock will be available to market or listed price.